The John Glenn High baseball team poses with the championship trophy after winning the AA Division of the St. Paul Easter Tournament. The Eagles defeated Cerritos High 5-3. The championship game of the St. Paul Easter Tournament’s AA Division was a small preview of what to expect in early May as it relates to Suburban League baseball. 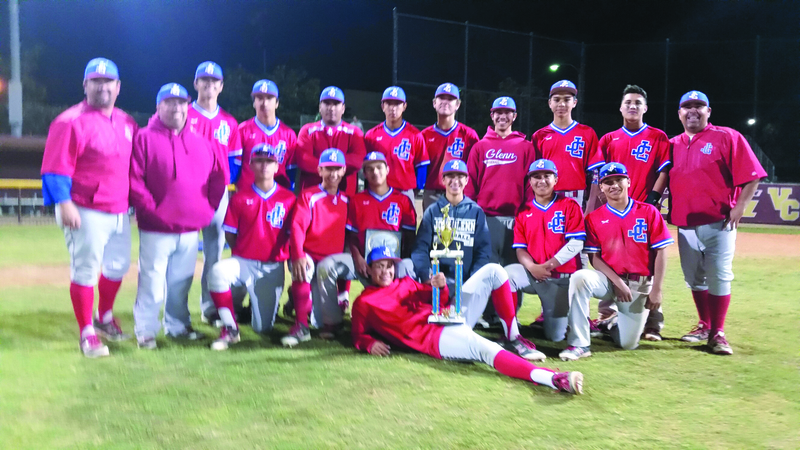 Cerritos High and John Glenn High went toe to toe and it was the latter which came out on top, building a four-run lead and holding on for a 5-3 victory this past Wednesday night at Valley Christian High. The Eagles were leading 4-2 but needed to get an insurance run in the top of the seventh inning as sophomore left fielder Chris Munoz, the No. 9 batter in the lineup, was walked on four pitches and scored on a two-out hit from freshman third baseman Joseph Angulo. The run was critical considering the Dons had scored once in their half of the frame and then loaded the bases with two outs. Glenn (8-7 overall) got things going in the second with three runs on just one hit. Freshman center fielder Michael Hill reached second on an error and stole third before sophomore designated hitter Humberto Chiquito was hit by a pitch. A single to right field from freshman catcher Alexis Martinez brought in Hill and when sophomore second baseman Alex Alcaraz reached on a fielder’s choice, it was 2-0. Alcaraz would eventually come home on a groundout from junior right fielder Joe Gonzales. In the next inning, freshman shortstop Joseph Figueroa, the tournament’s most valuable player, singled to left and came home when Hill was safe on a fielder’s choice. The 4-0 lead was just enough for freshman pitcher Michael Gill, who pitched into the fourth and yielded two hits while striking out three. Cerritos (9-7) had five runners reach base in the first two innings but had just one hit. Then with one out in the fourth, Gill hit senior shortstop Jamriel Rodriguez and walked senior right fielder Erik Gomez. The Dons would knock Gill out of the game after freshman first baseman Bernardo De Leon’s single brought in Rodriguez. In came in sophomore pitcher Jose Llamas and on his second pitch, senior third baseman Jason Prieto singled to left field to plate Gomez and cut Glenn’s lead in half. Llamas, who got the victory, would then retire the next six batters and be replaced by Figueroa with two on and one out and two on in the sixth. Meanwhile, Cerritos senior pitcher Kyle Suezaki was settling down in the middle innings and did not allow a runner past second in the fourth, fifth and sixth innings. The Dons would load the bases in the sixth but came away empty. Then in the final inning, they had their chances again. Suezaki led off with a single to right and stole second. After a sacrifice from senior centerfielder Tyler Beyer, junior catcher Brett Wells laced a single down the left field line to make it 5-3. That was followed by an infield single from Rodriguez and after a fly out, De Leon was walked to load the bases. But another deep fly to right field ended the suspense and the game. Angulo and Alcaraz each had two hits for the Eagles, who made their way to the finals by winning their pool with wins over St. Bernard High (14-3 on Mar. 17) and Long Beach Jordan High (17-0 last Saturday) before losing to Bishop Montgomery High 3-2 this past Monday. Glenn would rout Valley Christian High 13-1 this past Tuesday in the semifinals. In that game, Figueroa went three for five and drove in a run while Chiquito and Martinez each had a pair of hits. Angulo, Chiquito and Martinez were named to the all-tournament team as Glenn resumes league action on Wednesday with a home game against league favorite La Mirada High in the front end of a home and home series. Suezaki and De Leon each had a pair of hits as Cerritos also won its pool with wins over St. Genevieve High (6-2 on Mar. 14) and St. Monica High (5-2 last Saturday) before losing to Mary Star of the Sea High 4-1 this past Monday. The Dons then blasted Bishop Montgomery 13-1 this past Tuesday in the semifinals behind a 19-hit attack. Beyer went five for five with three runs batted in and scored three runs and every Cerritos starter had at least one hit. Beyer and Rodriguez were named to the all-tournament team. The Dons will host Mayfair High on Wednesday in the front end of their home and home series with the Monsoons. The rematch with Glenn will be on May 4 at Cerritos and May 6 at Glenn. I guess an average pitcher is good enough to beat Cerritos!! Be classier coach P!?! ?